1) China will stay on the Green Path and it is essential that US and China find ways to cooperate on Climate Change, Clean Tech (hybrid electric cars), and Carbon Capture and Storage. 2) Confirmed my opinion that the real game-changing technologies and innovations are not going to come from the big, dinosaur players in industry or environment, but from the small, disruptive companies. 3) We have a tremendous opportunity with Dr. Jane Lubchenco at the helm of NOAA to get some more rigor and pragmatism to the debate on climate change impacts, mitigation, and adaptation. Fantastic final day at AEF09. 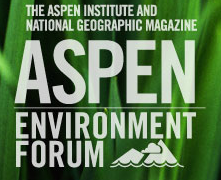 Those of you who follow me on Twitter know that I've been at the 2nd Aspen Environment Forum (AEF) this week. Like the Aspen Institute's Ideas Festival, the AEF is an unusual confluence of individuals from a variety of sectors gathered together for, well, conversation. I like this conference because of its mix of business people, NGO wonks, scientists, writers and artists, a smattering of government types, investors, and residents of Aspen. There are always intriguing synergies that develop when you pull together such a mix, and there are too few conferences that do it so well. This year's dialogue is focused on energy and, ostensibly we're here to consider the world's needs, the alternative solutions, and the related environmental impacts or benefits. But as much as I enjoy this conference, I'm also a little frustrated by it. Throughout the conference, two things have struck me as problematic and perhaps in need of being addressed next year: a noted absence of conflict and a disconnect between some of the advertised topics and the sessions as conducted. At least in the sessions I've attended, there has been a little false advertising. One example is yesterday's session on "Environment and Energy: Perspectives from Emerging Economies," which featured some very powerful women, including Queen Noor al Hussein and Alicia Antonio de Abreu from Mozambique. While I agree that energy and environment issues affect women disproportionately and in often adverse ways, the discussion quickly shifted from the advertised topic to a dialogue on gender equity. Now, don't get me wrong, that's a good topic for discussion, but not what most of us in the room came to participate in. Even more frustrating was the session on "Environment and New Media." Of the panelists, only Joel Makower (founder of Greener World Media and its related online publications, one of which I have written for in the past) could really be considered part of the "New Media." The others, including Douglas Fischer of The Daily Climate and Margie Kriz of National Journal, were decidedly "old media" and proud of it. The panelists spent much of the time wringing their hands about the decline of newspapers and other print media. They also trashed bloggers as opinionated yahoos who don't practice journalism and are forcing the old media stalwarts to adapt to changing customer habits and needs, which might lead them to give up journalism and become news aggregators. And it was solely focused on news/journalism and delivery. Where was the dialogue on mobile apps, social networks, and other new media? A missed opportunity. Engaging the speakers and moderators in developing the overall theme and designing individual sessions may help in future conferences. Among the highlights of this year's conference: Dr. Jane Lubchenco's conversation with the Washington Post's Juliet Eilperin. We are very lucky to have Dr. Lubchenco at the helm of NOAA; she is a brilliant scientist with a unique ability among brilliant scientists to communicate effectively to a general audience. There was also better international representation this year, with people from several African countries, Latin America, the Indian sub-continent, the Middle East, and China. I'm hopeful that today's program, which includes dialogues on conservation, energy efficiency, the Arctic, and China, will be focused and stimulating. Tom Tuffey, an energy expert with 35 years in the environmental field, spoke to a rapt crowd of 225 clean energy enthusiasts at the REBN, Mid-Atlantic's second event last night. Tuffey, who runs the energy and environment practice at PennFuture, talked about a perfect storm of opportunity, incentives, and capital coming into the region's burgeoning clean tech sector. The crowd, gathered in the upstairs room of Maia Restaurant in Villanova, PA, consisted of entrepreneurs, investors, and service providers who hope to benefit from the scenario Tuffey described. "You need to be vigilant," Tuffey cautioned. "Lest your boat spring a leak or get swamped by the sea of competitors in this storm." As an example of what Tuffey sees in terms of opportunity is the region's nascent solar development. "We're behind on solar," Tuffey said. "But I believe solar installations in the state will grow from the current 600-700 to 13,000-14,000 in the next few years." State legislation passed last year, designed to reduce electricity demand in Pennsylvania will also contribute to alternative energy development in the state. "It's just coming fast and furious from every side," Tuffey said. "The opportunity is tremendous and you need to figure out your piece of it, concentrate on that, and be diligent." Those who do, Tuffey suggested, will thrive. Many in the crowd hope to be among those who thrive. And their excitement was palpable as Tuffey reported a litany of numbers that grew to upwards of a billion dollars in alternative-energy and efficiency investments he expects to pour into the state over the next few years. This is a perfect storm that stands to raise all boats, according to Tuffey, from the entrepreneurs in the room to the guys with hammers and caulking guns Tuffey met with earlier in the day. "It's a terrific opportunity for the region and a great thing to see," Tuffey concluded. Social enterprise needs access to the same sort of support as the for profit sector. Organizations like Ashoka, Skoll, Echoing Green, Acumen Fund, and Endeavor provide a kind of venture capital infrastructure for emerging and growing social entrepreneurs. L3C and B Corp are beginning to build a framework for a new kind of corporate structure, one that blends social good with profit. And conferences like this week's Skoll World Forum and the Global Philanthropy Forum provide a platform for both recognition and exchanging ideas. Now, with GoodCompany Ventures, there is a business incubator targeting entrepreneurs with innovative solutions to unmet social needs. A "virtual incubator," along the lines of TechStars and DreamIt Ventures, GoodCompany Ventures will provide facilities, mentoring, and access to a network of capital sources to qualified entrepreneurs whose business models offer investors an attractive mix of financial return and social impact. "The program is the first of its kind in the social sector, repurposing a proven venture strategy in this emerging sector", said Jacob Gray, partner with Murex Investments in a press release today. "Unlike conventional venture incubators, GoodCompany Ventures doesn't extract an equity commitment from entrepreneurs, but expects a commitment of time and creativity toward building a community of social entrepreneurship." Garret Melby, founder of Iolite Social Capital, and a partner in GoodCompany Ventures, suggested that "just as Xerox Parc, Idea Lab and other technology incubators helped create the foundation of the information economy, GoodCompany Ventures will support entrepreneurs seeking to build a socially and environmentally sustainable economy." Applicants will be recruited nationally via venture capital, social finance, and academic networks. A pool of 8 – 12 candidates will be selected to participate in the 2009 incubator program starting this June. The program has been developed jointly by Resources for Human Development, Inc. (RHD), an innovator in social finance with a successful track record in social enterprises, and Murex Investments, a "double bottom line" equity fund backed by leading financial institutions. Applications to the Program are now being accepted online at GoodCompanyVentures.org. The deadline for applying is April 20, 2009. More information is available at GoodCompanyVentures.org or via email at info@GoodCompanyVentures.com. "You've got to have shitloads of M-O-N-E-Y, money," Liz Phair growled, back when she knew how to growl. It's true. Readers of this blog know I believe the only way we shift to a new green economy and address global environmental issues is by turning greed to green. When it's clear money can be made, folks will turn to greener pastures. From the number of green investing books I've seen over the past year, people are starting to think maybe the time has come. I was surprised by a book Wiley sent me recently, Billion Dollar Green: Profit from the Eco Revolution. Surprised, in part, because it didn't look like a "green" book. Sure its color is green and the type is ecofriendly. But then there's the guy in the suit. He looks like a banker in his contrast-collar shirt and pinstripes or a television personality the way he's facing the camera awaiting his cue. Enter Tobin Smith, founder and editor of ChangeWave Investing and co-star of Fox News Channel's "Bulls & Bears." Smith, who had a bestseller with his 2000 book ChangeWave Investing: Picking the Next Monster Stocks of the New Economy, has built his reputation on identifying ways to make money from periods of change. Only trouble is, everything changed once this book hit the shelves. Green was golden when this book was being written and when it went to press, but by December green's gold had tarnished just a bit too much for most investors. It's not Smith's fault. He has some good insights in Billion Dollar Green. It's just that the profit may be a longer way off. I agree with many of his green stock choices (including some of my longs) and the future market potential he sees in the smart grid, LED lighting, efficiency, and advanced batteries. "It was this early recognition of the secular shift in the supply and demand for fossil fuels in the new twenty-first century global economy that led us to conclude that, for the very first time, economics -- not just environmentalism or tree-hugging wannabes -- would drive the decades-plus secular transition to alternative energy technology." That's the new green economy, baby. Driven by the economic opportunity, not altruistic idealism. Bring it on! I'll admit that I find Jim Cramer, host of CNBC's Mad Money, entertaining. Cramer is entertaining in the same way as those old "Crazy Eddie" ads: "He's IN-sane!" Cramer's enthusiasm and showmanship is fun to watch and his crazy antics are amusing -- throwing pies at CEOs on his Wall of Shame, punching buttons like a carnival barker to generate hoots, hollers, and recorded noises and phrases. But as Jon Stewart said in his skewerview of the frenetic host, Cramer is a snake oil salesman. To the extent that he taught folks how to think about investing, that was a good thing. And in his defense, Cramer often warned retail investors to do their homework, to only buy stock in companies they understand and whose products they use, and to be diversified. That a majority of his viewers didn't take his advice and just bought when he punched the "Buy, buy buy" button or sold at "Sell, sell, sell," it's probably their own damned fault. But it's the larger picture that really bothers me. CNBC's business model seemed to be based on the cult of the CEO, wealth-worship, and a hubris of growth. They forsook journalism for entertainment. And this was clear from Cramer's response to Stewart's taunts on the subject: "CEOs lied to me." To which Stewart quipped something like "What happened to Journalism 101?" You don't take their word for it; you investigate further. I stopped watching CNBC late last summer. I couldn't take it anymore. The smarmy hosts of Squawk Box every morning were two-headed beasts, simultaneously crying "The sky is falling," while licking the loafers of the parade of CEOs and other executives who were the proverbial wolves in sheep's clothing. As it turns out, most of the CEOs were lying or at least not being entirely truthful -- or worse, they were really clueless themselves. Our collective rage was unleashed by Jon Stewart on the nonplussed Jim Cramer. Cramer was our scapegoat and his mea culpa and pleas of I'll try to do better seemed genuine. I didn't see his show the day after the Stewart interview, but that would have been an opportunity for him to apologize to his viewers and begin to make amends. I understand that it was just more of the same. It's too bad, because I really think we're at a pivotal moment. We have an opportunity to shift the way companies are run, journalism is practiced, and business is pursued. We should seize this opportunity to fire the bums and create a new standard of trust and transparency for CEOs, the journalists who cover them, and the consumers who buy their stock, products, or watch their programs. A sustainable economy will require a new kind of CEO and a new relationship between companies and the media that writes about them. It will also require that we as consumers and viewers take more responsibility for doing our homework and maintaining a healthy skepticism. Well, it's official, Van Jones will be joining the White Center on Environmental Quality as Special Advisor for Green Jobs, Enterprise and Innovation. Finally, an entrepreneur in the White House. Perhaps he can things going in the right direction. "Your goal has to be to get the greenest solutions to the poorest people," Jones told Elizabeth Kolbert of the New Yorker in a profile in January. "That’s the only goal that’s morally compelling enough to generate enough energy to pull this transition off. The challenge is making this an everybody movement, so your main icons are Joe Six-Pack—Joe the Plumber—becoming Joe the Solar Guy, or that kid on the street corner putting down his handgun, picking up a caulk gun." Hopefully, this will be an opportunity for Van to expand his work started with Green for All, making the transition to the new green economy. I wonder about how he'll fair in a government position. Van has excelled as an entrepreneur, first starting the Ella Baker Center and then Green for All, which requires nimbleness and resourcefulness. The White House hasn't exactly been known for that in the past -- and despite all the talk from Candidate Obama, it hasn't seemed particularly entrepreneurial thus far under President Obama. A Tweet over the weekend by Karl Burkart of GreenDig has spread like wildfire on the blogosphere: Van Jones has been confirmed as the nation's first Green Jobs Czar. greendig: Big news!! An inside source reports Van Jones just confirmed as Obama's Green Czar and will be moving to DC shortly. I retweeted Burkart's original Tweet on Saturday and several others did the same to mine (view). But is it true, just a rumor, or wishful thinking? One of those things that become truth because so many people repeat it over and over? I noted that almost the ONLY source quoted for almost every reference on Twitter is the same shortened url: http://tinyurl.com/bf6mdf, which points back to the original GreenDig article. And a scroll down the Twitter Search reveals very little additional information: Search. In addition, a Google search on the terms "Van Jones" + "Green Czar" this afternoon, also results in very little new information or details from credible sources. Almost every reference refers back the Burkart tweet or his GreenDig article, some even quoting it as an original source! Not satisfied, I called The White House and they had no information about such an appointment. I have a call and an email into David Falkenstein, of Sunshine, Sachs and Associates, who represents Van Jones' Green for All, as well as an email to Van and to his office. And have pinged Karl to ask him to share his source. As of 2:30 EDT this afternoon, I have not been able to confirm this appointment. Stay tuned. We are a people of trade. Trading is what we do. Trade was the main activity of our prehistoric ancestors -- at least those who weren't out hunting and gathering; they bartered or exchanged goods and services with one another before money was invented. According to Peter Watson, author of Ideas: A History of Thought and Invention from Fire to Freud, the history of long-distance commerce dates from around 150,000 years ago. What I love about Twitter is how quickly our idea exchange pays off. We toss out an idea and people trade off it and each other. That is our trade. The willing exchange of ideas? Priceless.